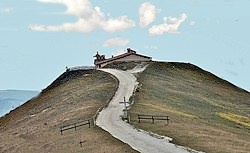 According to the local chronicles, St Facundinus initiated the tradition of eremetical life on “monte Appennino, quod Serra Sancta dicitur” (i.e. Monte Serrasanta, northeast of the modern city) in the late 6th century. The author of the 14th century Leggendario di San Francesco wrote that many of the servants of God had lived as hermits here from that time until his own. St Francis had preached “in convalle ipsius montis” (i.e. in what became known as the Valle di San Marzio) and had stayed with his brothers there in the hermitage of SS Stefano e Lorenzo (below). The Eremo di Serrasanta (below) was built at the summit in 1547. St Francis allowed Brother Fava to leave the Franciscan hermitage mentioned above to live as a hermit, despite the objections of the other friars. Mario Sensi (referenced below) suggests that this probably occurred under the auspices of Fr Elias of Cortona, to whom St Francis entrusted the direction of the Franciscans in 1221. Fra Fava went to live “subtus heremitorium Campitellae” (under the hermitage of Campitella) on the side of the mountain. The CAI 208 footpath passes a cave below the Fonti di Campitella that is known as the Grotta di Frate Fava (see the page Excursions from Gualdo Tadino). Castel Veccho, the “primum castrum Gualdi” (the first walled settlement of Gualdo), was built in ca. 1208 in the Valdigorgo, on the lower slopes of Monte Serrasanta, to the south east of Gualdo Tadino. It burned down in ca. 1237 and was rebuilt on its current site. Like the Eremo di SS Stefano e Lorenzo, they were used mostly radical followers of St Francis. who eschewed the conventual life led by the majority of their order. Bishop Alessandro Vincioli merged these communities in 1349, but allowed them to remain independent of the Franciscan Order. Instead, he subjected them to episcopal control and gave them a form of life that respected their eremetical lifestyles. Mario Sensi (referenced below) identifies this as an early move towards the Franciscan congregation of the orthodox Clareni, which received papal approval in 1474. The Blessed Tomasuccio lived here from 1367 until 1370, when he was accused of heresy. He found it expedient to depart for Tuscany. The Blessed Martius joined the new Franciscan community at the Eremo di SS Stefano e Lorenzo in the Valdigorgo in ca. 1219. When it burned down in ca. 1237 the friars were forced to move to a new location. (It is not clear where this was: the construction of the convent of San Francesco in the rebuilt settlement seems to have been started in ca. 1288). However, the Blessed Martius decided not to move with the friars, preferring to stay with some companions in the Eremo di SS Stefano e Lorenzo. A legacy was made in 1290 to the “ecclesie fratrum Martij’. The friars here followed the example of St Francis, living in complete poverty and relying on alms from the people of Gualdo. The Blessed Martius died here in 1301, at the age of 91 and was buried in the church of the hermitage, which was from this time dedicated as the Eremo di San Marzio. It is clear that the hermitage continued to be occupied by Franciscan hermits. For example, in his will of 1492, Matteo da Gualdo requested that his body should be carried by “frati eremiti abitanti nell’ Eremo di San Francesco, fuori della città” during its burial in San Benedetto. However, this structure collapsed in ca. 16oo. 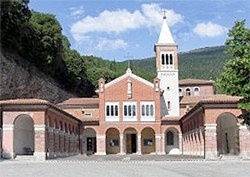 The relics of the Blessed Martius were moved to the nearby tiny church of Sant’ Anna (above). When this church also collapsed in 1608, the relics were moved again to San Rocco. The derelict Eremo di San Marzio was restored in the 1947 and again after the earthquake of 1997. A community of Observant Franciscans established itself at San Tommaso from ca. 1487. Perhaps for that reason, Fra Marino di Antolino de Curtis da Offida, who belonged to this community, persuaded the Commune to cede some land for the construction of a larger hermitage to house the other friars. The friars rebuilt the church in 1629. The community was suppressed in 1860, but the friars managed to return in 1882. This altarpiece has recently been attributed to Avanzino Nucci. ✴St Joseph, on the right. This panel from SS Annunziata, which is now in the Pinacoteca Comunale, is attributed to Matteo da Gualdo. This pseudo-Byzantine icon from SS Annunziata is now in the Pinacoteca Comunale. This altarpiece from SS Annunziata, which depicts St Diego curing a blind man, is now in the Pinacoteca Comunale. Its inscription records that it was painted in Rome in 1620 by Avanzino Nucci. This site is on the lower slopes of Monte Serrasanta, to the north of Gualdo Tadino. This hermitage is documened for the first time in a will of 1288, which contained a bequest to “fratribus morantibus apud Capodacquam pro oratorio”. It had become a Benedictine monastery with its own church by 1328 and joined the the Congregazione del Corpo di Cristo in 1345. It was documented in 1499 but subsequently became derelict and was demolished. This panel in the Pinacoteca Comunale, which is attributed to the Sienese Sano di Pietro, depicts the Coronation of the Virgin in front of a clothe of honour held by praying angels. Two angels with musical instruments stand to the sides. A note that seems to have been attached to the panel in the 19th century claimed that it belonged to one of the monks of SS Gervasio e Protasio and gave the date, 1474. It identified the praying figures below as Bl Angelus and Blessed Andrea di Paolo. However, Enzo Storelli (referenced below) has identified these kneeling figures as the Blessed John Colombini and St Jerome. Since the former had founded the Gesuati in 1360 and since this order had a particular reverence for St Jerome, he suggested that the panel was almost certainly painted for one of its churches. However, its provenance is unknown before 1872, when it was documented in the sacristy of San Francesco. Enzo Storelli also dated the work to ca. 1445. 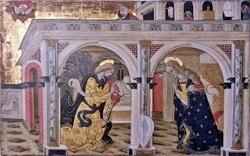 The Blessed Angelus entered the monastery of SS Gervasio e Protasio in the late 13th century. He soon decided that he needed more solitude, and lived for some 30 years as a hermit walled up in a cell that his parents built for him near the Sorgenti di Capodacqua. When he died here in 1324, his body was taken in procession to Gualdo Tadino, as the hawthorn bushes (biancospina) miraculously burst into flower. In 1450, Bishop Giovanni Marcolini consecrated the Eremo del Beato Angelo, which had been built on the site of his cell. In 1569, Cardinal Giovanni Antonio Serbelloni, the Abbot of San Benedetto, gave the chapel to the Capuchins from the nearby convent of Santa Maria del Divino Amore (below). The Commune built this church and convent for a community of Capuchin friars on the site of a Benedictine monastery that had been dedicated as San Michele Arcangelo. As noted above, Cardinal Giovanni Antonio Serbelloni, the Abbot of San Benedetto, gave the Eremo del Beato Angelo to the friars in 1569. This allowed the friars to establish an orchard near their convent and allowed the Commune to improve their access to the city. The convent was enlarged on a number of occasions, for example after the plague of 1656-57, when the citizens rewarded the friars for their recent help. The community was suppressed in the period 1810-8 and again in 1867. Bishop Robert Calai, who bought the complex in 1880, restored it and adapted one of its two chapels, the Cappella di Sant’ Antonio da Padova, as a burial chapel for his family. He gave the complex to the Capuchin Order in 1900. They established a seminary here and enlarged the church, which was reconsecrated in 1901. Bishop Calai was buried in the Cappella di Sant’ Antonio da Padova when he died in 1920. The second chapel in the church is dedicated to Santa Maria del Divino Amore. The hermitage stands on an elevated site that belonged to the Benedictines from the 11th century. The Confraternita della SS Trinità, who had an altar in San Francesco, built an oratory here in 1547 “per la funzione della corda pia” (for use as a place in which they could practice self-flagellation with the “holy cord”). It was restored in 2011 and serves as a refuge that can be rented by walkers. This website contains more information. The altar is made of a Romanesque pillar from San Facondino. This altarpiece in polychrome majolica relief was moved to San Francesco in 1926 after an attempted theft. It was replaces on the altar of the hermitage by the present copy, which was made at the time of the transfer. ✴The main part of the relief depicts God the Father enthroned with the Virgin and St Facondinus, flanked by the plague saints, SS Sebastian and Roch. Angels above hold the Host, representing the crucified Christ. ✴Figures of the Annunciation (a reference to the Holy Spirit) are inserted in the frame of the tympanum. ✴The predella depicts God the Father in a tondo flanked by male and female members of the Confraternita della SS Trinità (who presumably commissioned the altarpiece). It is now in the Ceramic Section of the Pinacoteca Comunale. Return to Excursions from Gualdo Tadino.